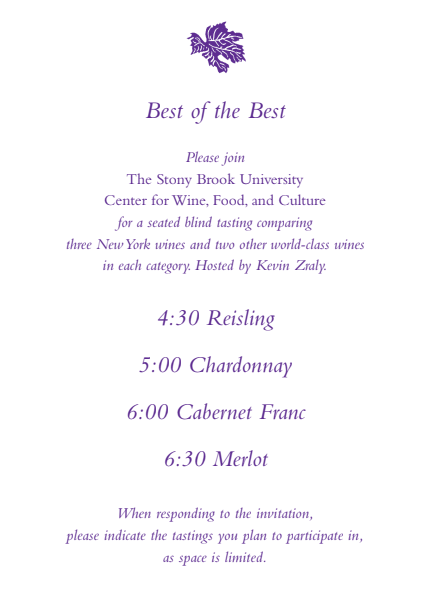 The Inaugural Event featured a wine tasting hosted by wine expert and founder of the Windows on the World Wine School Kevin Zraly, as well as foods prepared by celebrity chefs, including Waldy Malouf of Beacon Restaurant. In each of four categories—Riesling, Chardonnay, Cabernet Franc, and Merlot—New York wines were ranked among the top two choices. Local wines were matched against world-class vintages from France, Germany, and California. 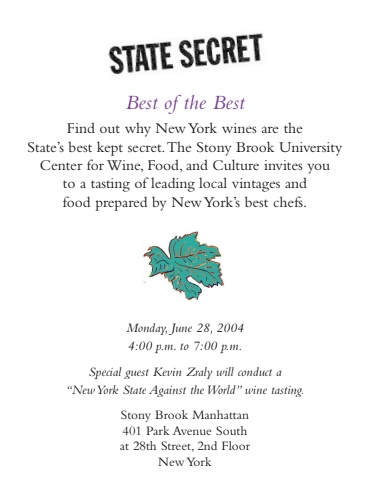 Highly-rated wines hailed from Long Island, the Hudson Valley, and the Finger Lakes region, including a 2003 Treleaven from Dr. Konstantin Frank’s Vineferea Wine Cellars in Finger Lakes; a 2001 Chateau Lafayette Renau, Proprietor’s Reserve, Finger Lakes; and a 2001 Reserve Merlot, Bedell Cellars, Long Island. Photos by Ginny Clancy and David Roberts.